At SAPT we tend to err on the conservative side of the training spectrum. Sure, there is a time and place for being pushed outside your comfort zone and try exercises that are challenging or working with weights that you never thought you’d ever lift… BUT that should only happen AFTER the foundation is unquestionably there. I’m primarily speaking about younger kids and adolescents, but the concept applies to adult trainees too. Movement- This is crucial. Poor or aberrant movement patterns only ingrain bad habits and set the trainee up for injuries down the road. This not only includes performing movements correctly, but also controlling one’s body in space. I’m talking about basic human/athletic movement like squat, hinge, push, pull, skipping/running, landing and jumping patterns… For example, I’ve witnessed kids perform a squat, technically correctly, but they have zero control over the speed of their descent. Strength base- This goes hand-in-hand with movement quality. Weak people move poorly because they lack the strength to move correctly or control the movement consistently. I’m not the best at these technological things, but I think it gets the point across. A deficit in either department will increase injury risk and continue to feed into the cycle of being weak and moving poorly. Hooray. Athletes and the parents of the athletes we train have all kinds of goals when they come to us. They want to run faster, jump higher, throw harder, be more agile, prevent injuries… this list goes on; these are all great things! Often, parents/coaches or even the athletes themselves have ideas as to what they need to accomplish those goals. 1. 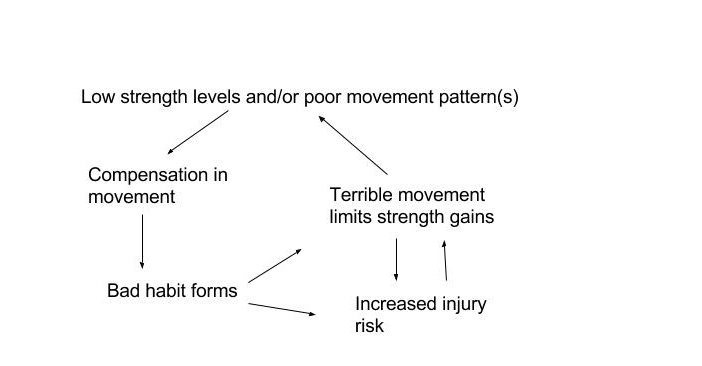 Primary athletic movement patterns-mentioned above- barely resemble human movement. 2. Strength levels that are less than optimal. To be blunt, many kids are weak and the move like garbage. The commonality with the athlete and parent requests mentioned previously is that they focus on a very specific aspect of athleticism or a sport. However, without the foundational stones of strength and efficient, correct human movement, all those lovely requests turn into Wile E. Coyote when he runs off the cliff. The vast majority of an SAPT athlete’s training for the first two to three months (with a few exceptions) consists of creating those foundational stones. At times it may seem tedious, because, to be perfectly frank, a multitude of kids move so poorly that we have to start with light weights and rudimentary drills to even begin the building process. This often also includes tearing down bad habits and reforming new ones, which simply requires both time and consistently showing up to train. It’s a process that can result in impatience due to lack of appreciation and understanding of the absolute necessity of that strength and movement base to start training the more “fun” or exciting aspects of athletic performance. Therefore, the onus is on us, the coaches, to explain to parents and athletes why we’re doing the things we’re doing instead of the flashy exercises that compose the common perception of performance training (I’m looking at you parachute sprints and your ilk). You’re weak and you move like garbage. We need to fix these two problems before we do anything else. As Dan John says, strength does magical things. I guarantee that when a person grows stronger and can perform the basic human/athletic movements well, their overall performance is going to improve dramatically-even before doing any of the fancy stuff. Be consistent in your training, trust the process, and you’ll reap the benefits. Older PostWhat is the Best Training Method?